Charming describes what you will find when you arrive at Charmante-on-Cayuga. 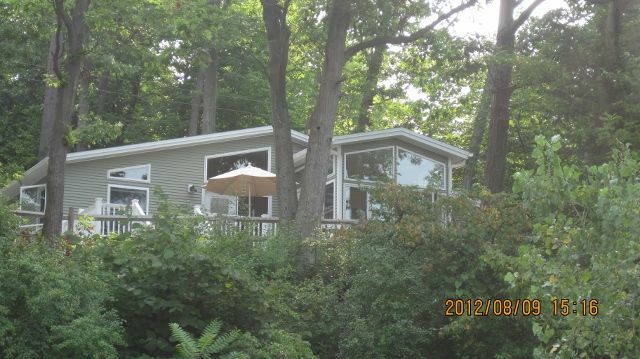 A quaint cottage with a large eat-in kitchen, a deck over looking the lake and a private beach. Just twenty steps down a gentle incline takes you to the waterfront. Enjoy a peaceful vacation at one of widest points on Cayuga Lake. Charmante-on-Cayuga is perfectly situated for family outings, walking, biking, touring wineries or just sitting on the dock. In the early morning one can hear the fish jump or the birds chirping. In the evenings, enjoy the stunning sunset while taking delight in the company of family and friends. Charmante-on-Cayuga has just completed a full renovation May 2012. Keywords: Two Bedroom Cottage with Three Season Porch! We have been renting on the East Shore of Cayuga Lake for the last few years and really fell in love with the area. Three years ago we purchased the adjoining property, Alilys-on-Cayuga, We just closed on Charmante in June. While we want folks to enjoy the cottage now, we are looking forward to a complete renovation in the late fall. It is just a great spot to relax and watch the world go by while having great amenities nearby! One gets the best of both worlds at Charmante-on-Cayuga! On one hand there is a great deal of privacy and quiet. The cottage has over 100 feet of lake front, a private dock, and a picnic table right on the beach for lunch or enjoying wine and cheese in the late afternoon. It is so peaceful on this bend in the lake! On the other hand, the cottage is 30 minutes to Ithaca, Cornell and Ithaca College with all of the hustle and bustle that comes with going into town. There are wonderful restaurants of every type in Ithaca, a fantastic Farmer's Market on Saturday and Sundays and lots of shopping. State parks are a short drive away for hiking & biking and there are numerous wineries throughout the Finger Lakes region. Charmante-on-Cayuga provides a great, central location to vacation where one can do nothing but sit and take in life or take advantage of all the area has to offer! The cottage has a full kitchen, stocked w/plenty of utensils, pots & pans & serving dishes, perfect for the cook in the family. Wrap up on chilly nights in comfy blankets, or take pleasure in the fire pit on the beach for romantic campfires. Not to worry…the cottage is heated! Bring your MP3 player and cd's, in the living area there is a stereo system to listen to your favorite music or catch up on the news on the radio. There is a lovely deck with scenic views. Really enjoyed this cottage... lovely spot with beautiful sunsets. We'll definitely be back! Delightful cottage in a beautiful, quiet setting. Cottage was very well appointed, clean and comfortable. Setting is one of the best on Cayuga Lake. We'll definitely be back. It was a fantastic location to bring family together and we look forward to returning. This was our second stay with the owners, but our first stay at Charmante (we had previously been at the neighboring Alilys). We were so delighted by everything about our stay: the beautifully decorated, comfortable, clean house; the gorgeous, tranquil location, which is also very convenient to Ithaca; the beautiful beach and amazing sunset show every night. We will definitely be back! This property was clean and tastefully decorated with lovely views of Lake Cayuga and evening sunsets. It was further from Cornell than we had hoped, but the drive was easy and peaceful between the two. Winieries! The Cayuga Lake Wine Trail! The Seneca Lake Wine trail is nearby along with many wineries in the Finger Lakes Region!